Two weeks in the job at the new location in Long Island City (or Sunnyside) Queens, and it hits me every time I arrive or depart on the E train, when I walk with the rest of the community college kids along the Thompson Ave. walkaway with the heavy traffic of cars nearby, as Thompson merges into Queens Blvd…. Anyway, I attended the evacuation training for new employees at work today, headed by Security Supervisor Andrew Tortoriello, who was a fellow LPAer. Andy is one of the best people on the planet. After he showed us the emergency exits, where we ended up on Skillman Ave. at Queens Plaza (awful traffic), Andy offered to pay for a free coffee/tea. I was the only one of the group who took him up on his offer. 7-Eleven. Every time I walk by it on Thompson Ave., I feel like I’m 12 again, saving up my pennies to buy a wad-full of Jolly Ranchers after school in the mid-1980s. This one is clean-ish, big, and fancy, compared to the ones I remembered in Oklahoma. Andy pointed out the “2 donuts for $1 sale”. What the hell, I thought. 2 simple yeast doughnuts. (Total of doughnuts this week: 3). The hot tea? 7-Eleven offered 6 different varieties. Not too shabby. 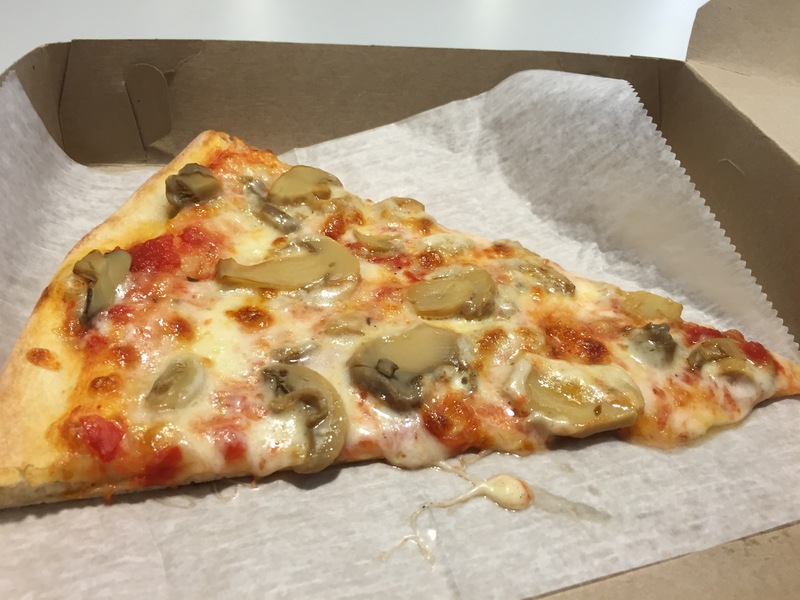 At lunchtime, I ordered a slice of mushroom pizza at Pizzeria Sicilla (or named Pizzeria Prezzemo on Yelp), which is literally next door to 7-Eleven, at 31-25 Thompson Ave. There is a red overhang with the words “Brick Oven Pizza”. Another co-worker, Camille, told me on my first day that the pizza was “excellent, so good!” Also, everyone at work orders from this place; I counted 5 slices being consumed in the break room yesterday. It was something to look into. Another wave of nostalgia: When I first moved to NYC in 2004, I worked at the Wilson Project for the New York Public Library, in the heart of Hell’s Kitchen, which has many wonderful eateries. The pizza was great there (I don’t remember the name of the place), where it was cheap, cheesy & tasty, New York style. This pizza today reminded me of that exciting time, when I was the new girl in town, trying to navigate into a whole new life. This pizza: a great mix of cheese and sauce, freshly hot from a brick oven, with mushrooms as big as pinky fingers. Pizzeria Sicilla is cash-only, very crowded and popular, full of community college kids and workers alike, with items like hot wings, garlic bread, chicken rolls (interesting) and numerous varieties of Snapple. No wonder librarians love this place! It is nice to work once again with the people I worked with back in 2004 and later on at LPA. Seems like old times….